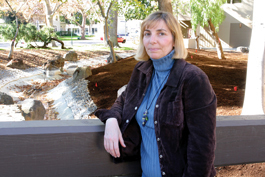 PUBLIC PARKING: Vocal open-space advocate Helen Chapman recently stepped down from the San Jose Parks and Recreation Commission, but she still has strong views on future planning for local parks. SAN JOSE'S neighborhood leaders and City Council say that San Jose's parks are a priority, but looking around you wouldn't know it. Projects like the Guadalupe Creek Trail have remained unfinished for decades; Parks, Recreation and Neighborhood Services is understaffed and the city isn't maintaining or improving what it has. Developers' kickdown of Parkland Dedication and Park Impact Ordinance fees (PDO) is giving the city plenty of no baño pocket parks, but there's no money to purchase Measure P's soccer fields. Helen Chapman is determined to change this. Because she wanted a playground for her 2-year-old, she joined Shasta Hanchett Park Neighborhood Association volunteers and worked with the city to build Hester Park. That inspired her to join the San Jose Parks and Recreation Commission, where she served six years, the last two as its chairwoman. She termed out in June, but she still goes to almost every meeting about parks and serves on the Coyote Valley Task Force. Chapman has strong views on the successes and failures of local parks, and spoke to Metro about what she's learned in her six years inside the system, as well as her hopes for the future of area open space. METRO: San Jose ranks as America's 10th-largest city. How does it measure up on parks, relative to its size? HELEN CHAPMAN: We did a lot of the research when we worked on increasing the PDO/PDI, and we found out that we're not No.10 when it comes to parks, trails and our open space. We're way behind, and that concerns me. I think that green space, trails, trees and quality of life should be something we're proud of and should be something we're known for. The CSAA [California State Automobile Association] magazine Via featured the 10 greatest [city] parks in California. San Jose wasn't on the list. We should be and we have the potential to be. Yes, that astounds me also. This came up this month when the city approved the Willow Glen Spur Trail. It was unanimous, but what about the financing? There's lots of money out there! Look at what Our City Forest [a San Jose nonprofit] does to get their trees. They leverage the money they receive from the city and get matching grants from the state transportation department. We could be doing the same thing, but we aren't putting the priority level up high enough. You fund what matters to the community. We don't need to keep making up ideas. There's a reason why people choose to live here. The weather is gorgeous. We should be capitalizing on the weather and get people outdoors. We have beautiful historic neighborhoods. Capitalize on that. Look what the city of Pasadena does with their historic neighborhoods. We're not doing that.